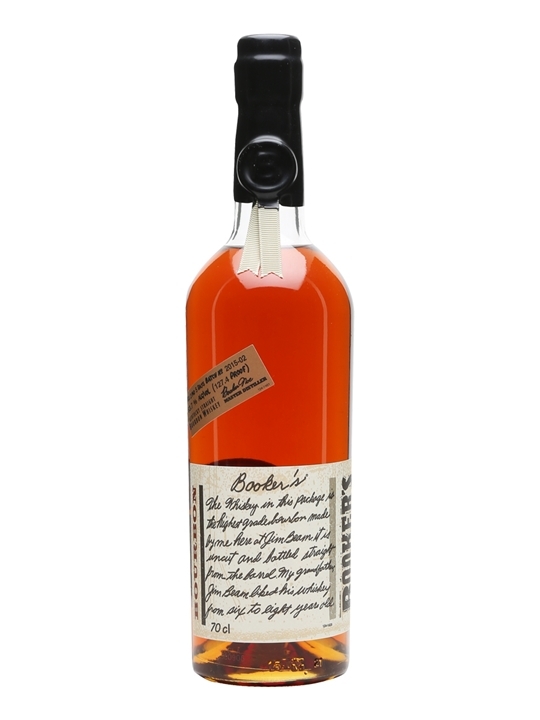 Booker's is a brand of bourbon and rye whiskey produced by Beam Suntory at the Jim Beam distillery in Clermont, Kentucky. Great taste and fragrance. It's best bourbon. Really great stuff, just too much. Intense flavours in a wild and a little unbalanced mix. Can't drink too much of it, but really crazy stuff!! Papaya, strong caramel, much vanilla, leather, plums, liquid glue, cloves, nutmeg, black pepper, popcorn and a nutty note. With water comes some mandarine and a slight grassy note. Very much caramel and vanilla, toffee, oily mouthfeel and watering, warm and nutty, this glue again and exotic fruits. A little over the top. Covers the whole mouth with the oily texture and chocolate and caramel notes. one of my all-time favourite Whisky's. extremely complex with sweet caramel and liquorice notes. Amazingly complexed. So much going on at the same time. Caramel, toffee, plum and corn. Add a bit of water and it just takes it to a completely new level. Kills the alcohol burn and enhances all the subtle notes. Nose: cola, buttered corn & caramel. Palate: spice, oak & iced tea. Finish: medium to dry.